The fourth Quarterly Breakfast of 2013 was held December 6, 2013. The Venturi Brighter Day Employee Fund awarded grants to the following five organizations: HEALS, CASA, SNAP, FOR, and Friend, Inc.
HEALS, Inc.( Health Establishments at Local Schools) is a 501(c)3 non-profit organization in Huntsville, Alabama dedicated to providing accessible quality, school-based primary health care for children through collaborative efforts with the Huntsville City/Madison County school systems and the medical community. HEALS provides on-site medical and dental care, mental health counseling, and social services. HEALS will use the grant money to purchase dental supplies. 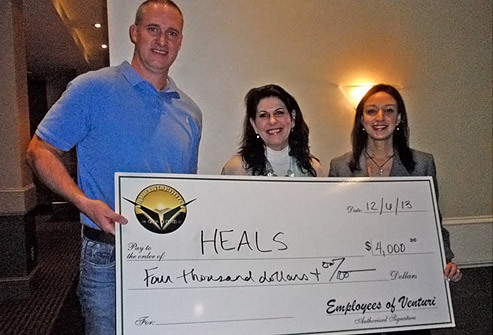 HEALS, Inc. accepts a $4,000 check from the employee Brighter Day Fund. CASA (Care Assurance System for the Aging and Homebound) provides services to individuals age 60 and older and to the homebound (wheelchair and bed bound) of all ages. CASA’s mission is to provide needed services to aging/homebound individuals that allow them to remain at home and age in place. Programs are designed to enable the elderly and homebound to maintain their independence, dignity, health and safety by providing services that specifically address their special physical and emotional needs. This quarters grant monies will be used to buy material to build 10 wheelchair ramps. 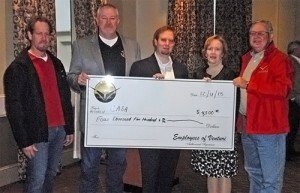 CASA receives a $4,500.00 check from the employee Brighter Day Fund. The Special Needs Accessible Playground (SNAP) is a boundless playground for over 1700 children with special needs in Morgan County and the surrounding area. The playground is safe and 100% handicapped accessible. Currently, there is a special swing area with a wheelchair accessible swing and a wheelchair accessible splashpad. 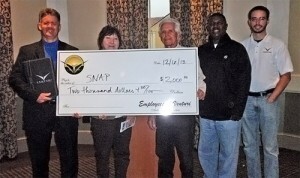 SNAP will use their grant money to buy wheelchair accessible sand diggers for Phase 3 of the playground construction. SNAP aaccepts a $2,000 check from Venturi employees. FOR (Friends of Rescue) identifies the animals most in need that are held in local high rate kill shelters. They provide lifesaving vet services (orthopedic surgery, heartworm treatments, management of chronic conditions) for animals that would never leave the shelter alive without assistance. All dogs and cats rescued by FOR are spayed or neutered, microchipped, vaccinated, parasite free, and are treated for all symptoms of neglect or abuse before being adopted to approved homes. Their committed volunteers host homeless animals in their homes, drive them to vet appointments, manage rehab and recovery after much needed medical treatment, attend adoption events, carefully approve and support potential adopters, and help to raise money to continue this very rewarding work. FOR has rescued almost 400 animals in 2013 to date. Monies given to FOR will be used to provide vet care to injured foster animals. 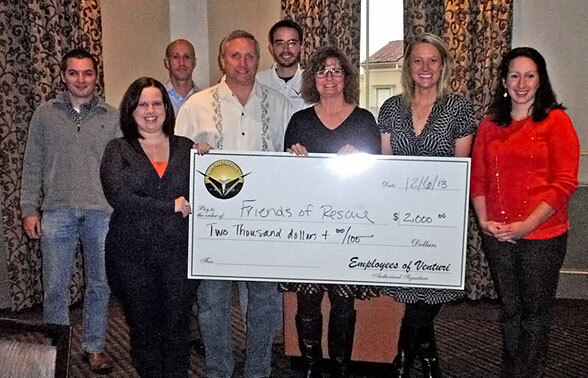 Friends of Rescue is presented with a check from Venturi employees. FRIENDS, INC. offers multiple support services to seriously ill and disabled patients, helping them to cope with their new circumstances and enabling them to maintain their independence. Services offered by FRIENDS, INC include transportation to medical and cancer treatment appointments, respite care for caregivers, running errands, helping in the home with daily living and household activities, emotional support through friendly visits and phone calls, access to community resources and spiritual support, medical supply lending closet, and access to a wheelchair-accessible van. 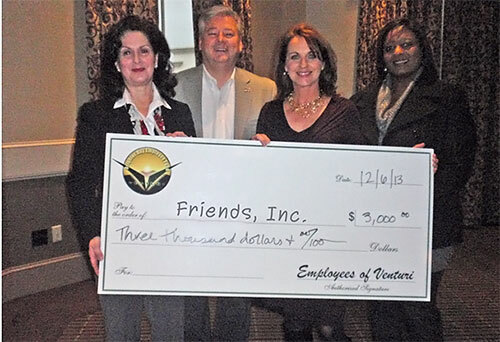 FRIENDS, Inc will use their grant money to provide information packets to market their services to those in need. Friends, Inc. is presented with a $3,000.00 check from the employee Brighter Day Fund.